IT’s A BEAUTIFUL day in Flint, Michigan. The sky is clear, flowers are in bloom and the volunteer gardeners in the edible flint Demonstration Garden are hard at work. Mike Roose is watering pepper plants in the raised-bed gardens. Scott Poinsett is trimming the garden perimeter, and Garden Manager Ginny Farah is harvesting crops for neighborhood residents. By the time they are done, the community garden will look its best in preparation for the evening’s food garden tour. “Gardening here goes back 100 years or more,” says MSU Extension Community Food Systems Educator Terry McLean. In addition to her role on edible flint’s Leadership Board, she is the liaison between edible flint and MSU Extension. Edible flint has existed as a network with workgroups since 2009, but it wasn’t until 2014 that it became a true nonprofit with an advisory board. “We support people who want to garden, we engage interested gardeners and we inspire people to garden,” says Garden Starters Training Coordinator Micah Williams, one of edible flint’s three paid employees. 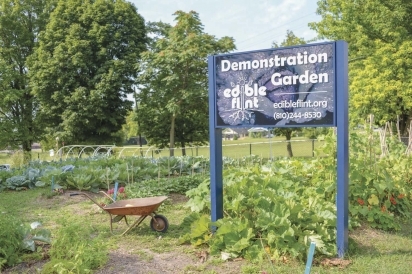 The most visible result of edible flint’s work is the demonstration garden located at the corner of Fifth Avenue and Begole Street across from the Hurley Medical Center. Employees from Hurley created the garden and maintained it for a few years but then asked edible flint if they would take it over. Edible flint adopted the garden in 2014. Volunteers are the fuel that feeds the demonstration garden. Garden managers Ginny Farah and Scott Poinsett work in the garden at least three mornings a week from April to October. “Between the two of us we put in a lot of volunteer hours, but we really enjoy it,” Farah says. In addition to edible flint regulars, volunteer groups from Whole Foods and Michigan State University have lent a hand this year. On distribution days, edible flint volunteers fill plastic bags with a variety of the day’s harvest. The produce they grow includes watermelon, tomatoes, okra, squash, collard greens and herbs. Farah says she likes to introduce a new vegetable each season. This year, they are growing long beans, a specialty of Asian gardeners. People trickle in to take the plastic bags of produce hanging on the garden fence. “We’ve gotten to know quite a few people who live in the neighborhood,” Farah says. She specifically plants okra for one neighbor, and McLean recalls the grandmother who said because of the garden, her entire family was eating healthy food that summer. In Flint, fresh produce can be difficult to find. In the past few years, several major grocery stores have closed their doors and left the city, and many of the city’s low-income residents don’t have a car to drive to the remaining places that do sell fruits and vegetables. “I think that gardening empowers people. Growing your own food is an essential skill, especially in a community where there are no chain grocery stores,” Williams says. To make food gardening affordable, edible flint sells highly subsidized garden starters kits. For $15, a beginning gardener gets 44 live plants, a bag of seed potatoes and 19 types of organic seed. The kit is designed to feed a family of four with a 1,500-square-foot garden. “It allows just about anybody the ability to garden,” McLean says. The program also offers low-cost soil testing, tilling and compost delivery. According to Williams, in 2017 edible flint sold 330 kits, delivered 377 yards of compost, tilled 27 gardens and distributed 58 water filters. To ensure success in urban food gardening, edible flint runs an 11-week garden starters class. Drawing on experts in the community, the class covers soil science, pest management, vegetable and fruit production and seed starting, among other topics. The class also includes an introduction to land access and food accessibility in Flint. “Every week has a new class topic and a new teacher,” Williams says. Key partnerships with the Ruth Mott Foundation, MSU Extension, the Michigan Food and Farming Systems and the Flint Farmers’ Market have contributed to edible flint’s growth. Part of edible flint’s strategic plan is to increase commercial food production and provide support for food entrepreneurs in the city and its surroundings. For a city with 42% of its population living below the poverty level, economic opportunities, food sovereignty and increased access to healthy food are just what the community needs.